Advances in digital and social media have lead to the public’s ability to easily connect with medical professionals, lifestyle coaches and other people facing similar health conditions to inspire, share, track and contribute to the democratization of healthcare. Through these interactions, individuals produce a trail of data that goes far beyond their medical records, ranging from online engagement to sleep, eating and social habits. This boon in social networking and progressive data capture has created a space for applying behavior modification theory to the every day lives of users, with the hope of improving productivity and wellness one small behavior at a time. Utilizing my professional experience in implementing various professional sports teams’ online engagement and sponsorship activation strategies, I have created and managed an 8-week online wellness program in coordination with the City of Ballarat and Paul Taylor, a research Professor of Exercise Science at the University of San Francisco and Director of the Body-Brain Performance Institute. Ballarat is a small city 65 miles outside of Melbourne, Australia with a population of just over 94,000. Established as a gold mining town from the 1850’s, Ballarat sits among rolling hills and grasslands like a city on the plains of Montana. Ballarat has seen a boon in agriculture throughout the last century and is now embracing online technologies as a means of economic development. Paul Taylor has worked with Garry Davis, the Executive Manager Organisation Services & Development for the City of Ballarat in recent years and was interested in using his lectures to City of Ballarat employees as a springboard for my wellness program. This opportunity aligned with my personal career goal of gaining international work experience and investigating new applications of technology in the wellness industry. The primary objective of this program was to study how elements of neuroscience, behavior psychology and military operations can best be applied to a scalable, online wellness program. A priority in this objective was to empower participants to make healthy changes in their personal lives and social networks by creating engaging content and a wellness strategy that was as entertaining as it was beneficial. How does online and social engagement with the program correlate to participants’ wellness goals? What forms of communication were the most effective in engaging participants and attaining their wellness goals? 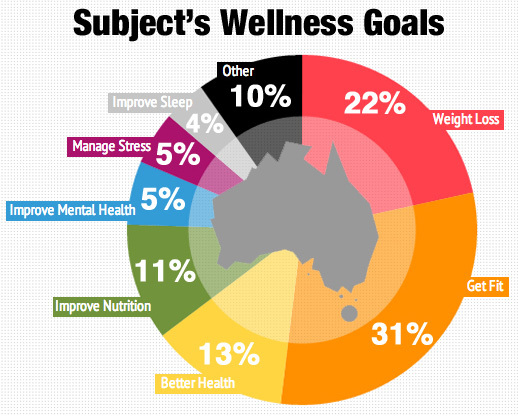 What were the most common wellness goals for participants and what behaviors did they change to achieve these goals? How does social engagement affect health? Fitbit user data to independently report participants’ activity levels. This Document is a Master’s Project which has been prepared at the request of and in connection with the University of San Francisco Sport Management Program. Neither this Master’s Project nor any of the information contained therein may be reproduced or disclosed to any person under any circumstances without the express written permission of Mae Schultz.